Michael came in for a consultation regarding his receding gums. "I'm in my 20s and I want to know if I need grafting." As we keep our teeth longer, we are seeing an increased number of people with recession. So what is gum recession? If you look in the mirror and see a darker or yellowish band of tooth exposed, right above the gum line, you might be seeing the roots of your teeth. Roots are meant to be surrounded by bone, just lie the roots of a tree are fully embedded into the earth. The roots of your teeth serve very much the same function as the roots of a tree: support the crown and facilitate nutrient transport from the outside to the inside. Whenever gums recede around a tooth, the bone recedes as well, leaving the root vulnerable to decay since it is not covered by enamel. Severe recession can cause the tooth to become loose, because it has lost bone support around it. Use your own tissue – this is called a gingival graft procedure, in which we take tissue through a small incision behind the upper teeth, and place it around the root of the recessed tooth. It is a successful procedure since we are using your own tissue. 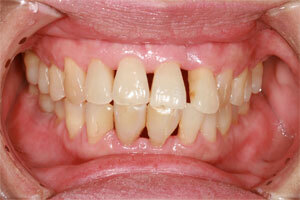 Use platelet rich fibrin (PRF) – Not everyone is a candidate for this procedure, only those with thicker gum tissue. We take some blood from your arm, separate the cells promoting healing and place it over the exposed root area. We then stretch the existing gum over it, to completely cover the recession. Use donor tissue – This has been successfully used for over 30 years with good success. Since it is human. It is extensively processed and freeze-dried to ensure effectiveness. It is the collagen fibers in this tissue which your body will use to form new gingiva around the exposed root. Since there are no live cells in this tissue there's no risk of rejections and it can be a good alternative is someone does not want to have a second surgical site behind the upper teeth. Use a bovine/porcine collagen graft – this is a technique I do not recommend for everyone, as it is specific to each person. If you have autoimmune problems, you might have a reaction towards this material. Studies are not there yet when it comes to these materials. These are materials also being used in a technique called the "pinhole". If you have gingival recession, see your local periodontist so that they can monitor it. The smaller the problem, the easier it is to treat, so don't wait until your tooth becomes loose or sensitive.